Need a bed upgrade for your little one? 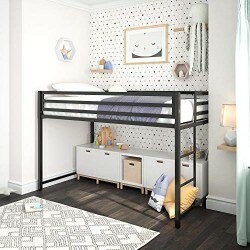 Look no further than the DHP Miles Metal Junior Twin Loft Bed. With a streamlined silhouette in solid metal and a touch of modern industrial style, this loft bed is a top choice. Crafted with a sturdy metal frame, it includes a ladder on the side for easy climbs up and down. The Miles is also equipped with full-length guardrails for ultimate safety and in addition, it comes with secured heavy-duty metal slats that provide ample support, stability and air circulation for the mattress to keep it as fresh as new. This loft bed is made shorter than the average height, making it ideal for younger children. Nonetheless, it has expansive under-bed clearance to maximize floor space in your child’s room. Available in multiple colors, the Miles Metal Junior Twin Loft Bed accommodates a standard twin size mattress of maximum 6 inches high (sold separately). Durable design. Made with a sturdy metal frame, full-length guardrails and secured metal slats (does not require foundation). Space-saving solution. Made shorter than the average height, making it ideal for younger children. Ample under-bed clearance of 36″ that can be transformed into study area or relaxing corner. Twin bed dimensions: 77.5″L x 41.5″W x 50″H. Weight limit: 200 lb. Ships in one box and assembles quickly and easily. Shipping dimensions: 78″L x 21″W x 5″H. Product weight: 60 lb. Gross weight: 70 lb.